Let Dream Construction Co. in Las Vegas, Nevada give your new home expert basement construction and design. Our professional home builders know how to create a basement that gives you extra living and storage space that fits your lifestyle needs. More space with the same footprint: You won’t need a bigger lot or sacrifice precious garden area to get more living and storage space. Energy efficient: Because the surrounding earth insulates basement walls, it can maintain a more constant temperature without additional heating or cooling. Multi-purpose use: You can use a basement for everything from a child’s playroom, to a home theater, to extra bedrooms, to creating a mother-in-law apartment. With all the benefits of having a basement, you’ll want to make sure to include one in your new home construction plans. Our expert team will design a plan to put all that extra space to good use. We are confident that you’ll love your basement. There is no one-size-fits-all when it comes to basements. Depending on your lot elevation, the style of your home, and personal needs, a basement can come in different forms. Full Basement: A full basement is a space beneath the house that is tall enough to stand in and covers the full footprint of the house. Partial Basement: As the name suggests, this type of basement only covers a portion of the house footprint. Daylight Basement: A daylight basement occurs with a house that is situated on a sloping lot. Part of the basement is underground, but the part that is on the sloping end will have full daylight windows. A daylight basement might also have an exterior door that leads directly into the yard. This type of basement is also known as a walkout basement. 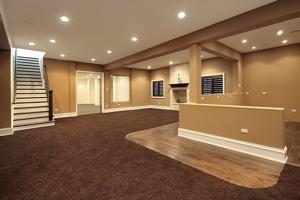 Finished and Unfinished Basements: You can choose to leave the cement walls of your basement unfinished until a later date, or you can have the basement finished, creating immediate living space. At Dream Construction, we will help you decide which type of basement is best for your property and needs. If you are considering building a home in Nevada, give Dream Construction in Las Vegas a call. With over 20 years of experience and a dedication to high-quality service and customer satisfaction, Dream Construction will provide you with a superior basement that will meet and surpass your expectations. Call us today to discuss how we can add a basement to your new home plans.